St. John's, NFL -- Bill Dineen occupies little more than a footnote in Philadelphia Flyers history. He was the ninth head coach in franchise history and the eighth man to hold the post when tabbed to take over for Paul Holmgren in December of 1991. Nonetheless, his legacy in the American Hockey League as a player, and most importantly, as a coach, was cemented on Wednesday as he joined the ranks of the illustrious in that league's Hall of Fame. Dineen, born in Quebec to an Anglophone family, first arrived in the AHL in 1958, and played for four teams over six seasons (Buffalo, Cleveland, Rochester, Quebec) while totaling 132 goals and 139 assists in 391 games. His greatest legacy was created in Glens Falls. Though only the home for the Phantoms for five years, and until the end of this season, the town is still awash in the glow from 20 years of success as a Red Wings affiliate. 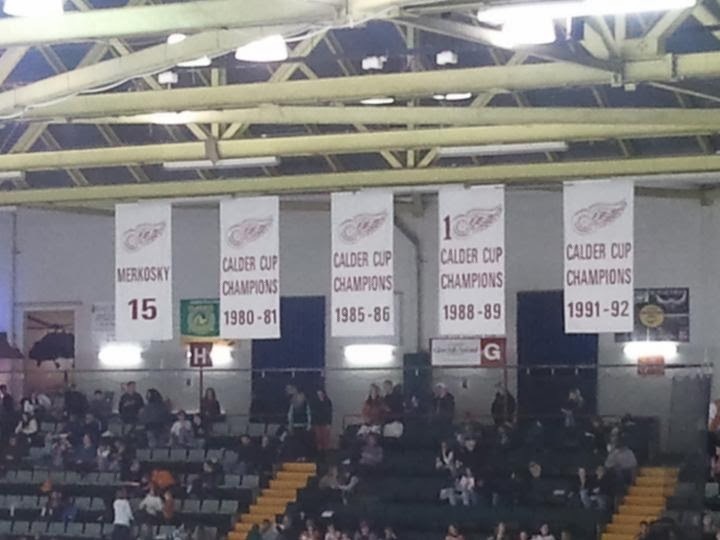 Dineen led the club from 1983 to '89, and was responsible for leading the club to the third and fourth banners in the above picture, ultimately winning 246 games and a pair of Pieri Awards (1985 and '86) as the top coach in the AHL. Dineen's 1986 Calder Cup winners were a study in absolute contract from their parent club. The Detroit Red Wings went 17-57-6, and allowed more than 400 goals in 85-86, the nadir of a franchise that still hadn't recovered from Gordie Howe's retirement 15 years earlier. The junior Wings, though, finished atop the Northern Division with a 41-31-8 record, then took down Fredericton, Moncton and Hershey to win it all. One more championship followed three years later. In '89, the grandfatherly leader benched two of his top players when facing an 0-3 deficit to Hershey in the semifinals. The Wings went on to win the next four games and then whipped New Haven for the title. It was a perfect exit for who, by then, was a permanent fixture in Glens Falls. Dineen made the jump to the NHL after that season, eventually landing with the Orange and Black on December 5, 1991. He holds the distinction of being the only man in team history to finish at .500, going 60-60-20, will go down in history as Eric Lindros' first NHL coach, and also had the pleasure for the only time in Flyers' annals to coach while one of his sons -- Kevin, who now leads the Canadian women's program. -- played a significant role on the club. Others enshrined on Wednesday were Al MacNeil, a standout defenseman and three-time Calder winner with Nova Scotia when it served as primary affiliate for the Montreal Canadiens; goaltender and four-time winner Bob Perreault; defenseman John Slaney, who spent more than a decade and a half as an AHL blueliner and finished his North American playing career with the Phantoms from 2001-07.